One 24 oz chocolate flavor Formula 7 Whey Protein. THE WORLD’S BEST QUALITY AND BEST TASTING PROTEIN. NO SUGAR, HORMONES OR CHEMICAL ADDITIVES – AMAZING TASTE! 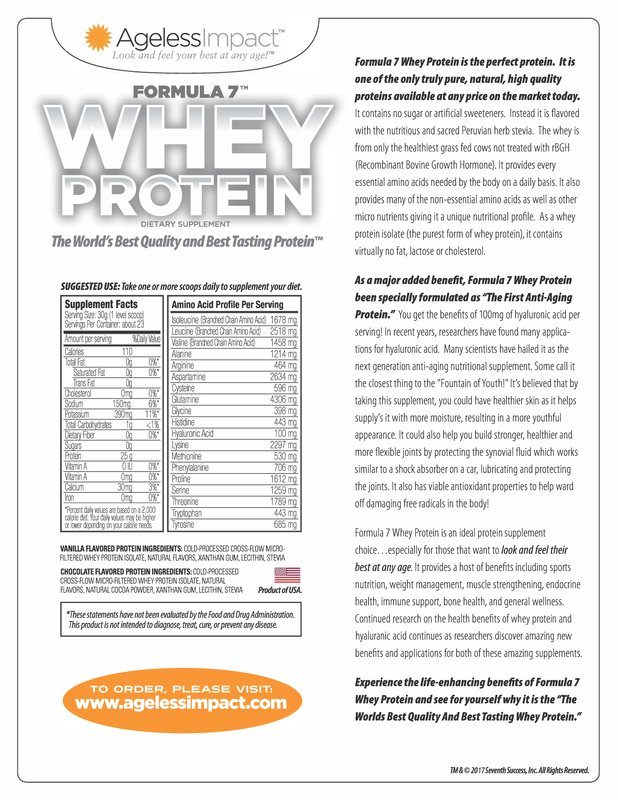 Formula 7 Whey Protein is the perfect protein. It’s one of the only truly pure, natural, high quality proteins available at any price on the market today. It contains no sugar or artificial sweeteners.Instead it’s flavored with the nutritious and “sacred Peruvian herb stevia”. 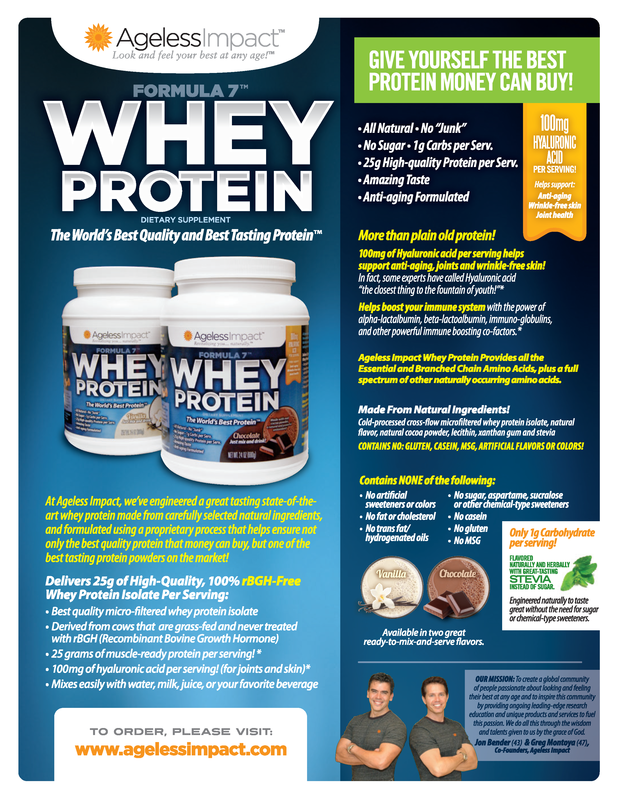 The whey is from only the healthiest grass fed cows not treated with rBGH (Recombinant Bovine Growth Hormone). 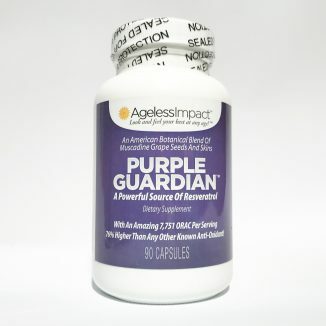 It provides every essential amino acids needed by the body on a daily basis. It also provides many of the non-essential amino acids as well as other micro nutrients giving it a unique nutritional profile. Natural Occurring Growth Factors found in Whey – helps aid cell rejuvenation, faster muscle recovery after exercise, and increased energy levels!Whey protein could also help optimize your body’s own production of glutathione. Glutathione is one of the most powerful antioxidants that the body produces and is used to bind and remove toxins, including heavy metals such as mercury and lead from the body. Levels may drop as result of oxidative stress due to disease, drugs, aging, toxic chemicals in the environment, inflammation and stress. Adequate levels of glutathione are necessary to provide important antioxidant protection needed by the cells, to help eliminate toxic metabolic waste products and to support the immune system. Glutathionehas a unique ability to maximize the synergistic effect of all other antioxidants, including vitamins C and E, CoQ10, alpha lipoic acid, and those derived from fresh vegetables and fruits. 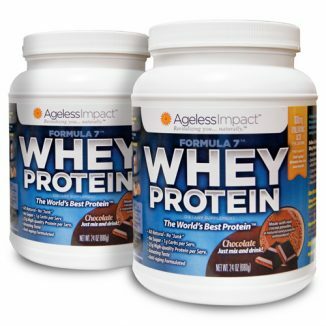 An optimal food source for maximizing your glutathione production is high-quality grass-fed whey protein such as Ageless Impacts Formula 7 Whey Protein!Not all Whey Protein Powders are Created Equal!Consumer Reports recently tested 15 protein powders and drinks and found three of them contained potentially unhealthy levels of arsenic, cadmium and lead. You will probably agree that ingesting potentially toxic doses of heavy metals daily with your protein drink is not a good thing! This is one reason why we do not recommend using traditional commercial type whey proteins. Another reason is because most contain whey protein derived from pasteurized, commercial dairy sources. Pasteurized milk is virtually devoid of glutathione-producing compounds, so if you consume whey protein derived from pasteurized milk you’ll miss out on this significant potential health benefit. Many commercial whey products are also flavored with chemical sweeteners which we believe is counter productive to your health.When choosing a whey protein powder we highly recommend considering the following…Is the whey derived from grass-fed cows that are not treated with dangerous pesticides or hormones? Is it cold processed? Remember, heat destroys the fragile molecular structure of whey! Is it sweetened naturally, not artificially with chemicals? Is it low in carbohydrates? 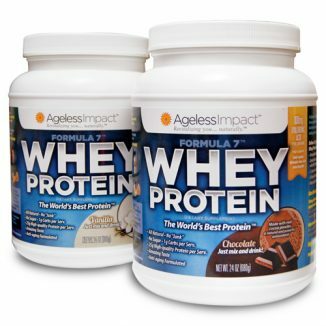 Is it highly digestible (void of long chain fatty acids — It’s important that it contains medium chain fatty acids (MCTs)We believe that our Ageless Impact Formula 7 whey protein powder meets all of the above criteria and by far is one of the best quality whey proteins on the market. It’s great for your morning breakfast protein needs as well as post work out. The best part is it tastes absolutely amazing!Do you have High Blood Pressure? Whey Protein May Help Improve the Health of Your Heart and Lower Blood Pressure!A study just published in the International Dairy Journal suggests whey protein beverages are effective at reducing blood pressure in people with hypertension.According to researchers:”We found that whey protein beverages lowered BP only in individuals with previously high BP, but not in those with normal blood pressure …These findings suggest that whey protein beverages had a normalizing effect on elevated BP and did not cause hypotension. This is important since hypotension can be a health concern in certain population groups, such as young women and the elderly.”The beneficial effects of whey protein may be related to its influence on nitric oxide production, which plays a role in blood pressure regulation.Sources:NUTRAingredients.com September 6, 2010 International Dairy Journal November 2010, Volume 20, Pages 753-760This latest study revealed amazing benefits of how whey protein could actually help normalize blood pressure levels, and could help reduce levels of hypertension. This is believed to be due to whey’s impact on nitric oxide production, since nitric oxide helps your vessels maintain their elasticity and by suppression them could leads to increased blood pressure. This benefit goes beyond those with just high blood pressure as its equally important to maintain healthy blood pressure levels for optimal health.One recent study suggests that supplementation with NOP-47, a whey-derived peptide had a positive influence on vascular health, even in healthy people. 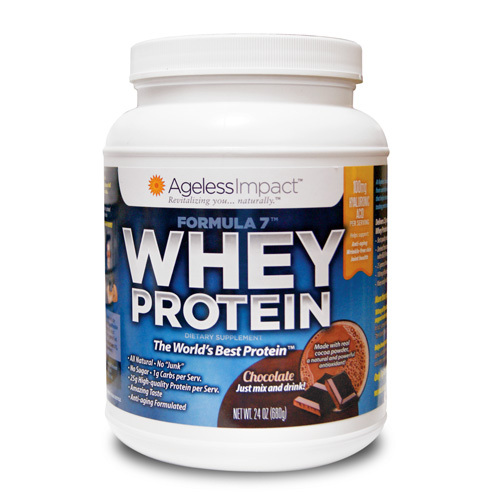 Blood flow in the arm showed and improvement of 2.7 percent per minute after ingesting whey protein! The study noted that there was no change for those who took a placebo. So regardless of your purpose of supplementing your diet with protein, keep in mind that as an additional side benefit of choosing whey you’ll also be supporting healthy blood pressure levels! When I took a look at the amount of carbs, I was expecting somewhere over 10 per serving. This product contains only 1 gram of carbs! To me, that’s all I needed to see. I bought most of their other products, why not just keep adding and try them all?